The Wellington Public Library is planning a Brick Reading Patio on the east side of the building where all the shade trees are. We hope to have it finished by the 2017 Kansas Wheat Festival. 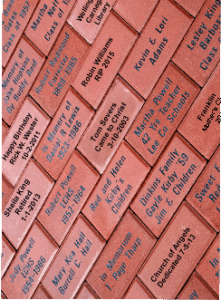 Be one of the first people to have a brick engraved in honor of a friend, a family member, or a special occasion and make them a part of a very special place. We are limited in the number of bricks we will use so get you order in now. The bricks have been purchased and are only waiting for your inscription. Just fill out this form and return it along with the payment to the Wellington Public Library upstairs circulation desk or you can mail it to us.